1525 - Portuguese explorer Alejo Garcia visits Paraguay. 1526 - Italian navigator Sebastian Cabot explores the rivers of Paraguay. 1537 - Spanish begin colonising the interior plains of Paraguay. 1609 - Spanish Jesuits begin converting the local population to Roman Catholicism. 1776 - Paraguay transferred from the Vice-royalty of Peru to the Vice-royalty of La Plata, which has its capital at Buenos Aires in Argentina. 1808 - Vice-royalty of La Plata becomes autonomous following the overthrow of the Spanish monarchy by Napoleon Bonaparte, but Paraguayans revolt against Buenos Aires. 1811 - Paraguay becomes independent. 1865-70 - Paraguay loses over half of its population and large tracts of land in war with Argentina, Brazil and Uruguay over sea access. 1932-35 - Paraguay wins territory in the west from Bolivia during Chaco war. 1954 - General Alfredo Stroessner seizes power in coup, ushering in more than 30 years of ruthless dictatorship. 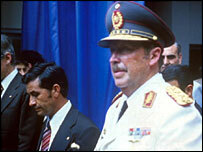 1989 - Stroessner deposed in coup led by Gen Andres Rodriguez, who is then elected president. However, Stroessner's centre-right, military-backed National Republican Association-Colorado Party wins parliamentary elections. 1992 - New democratic constitution promulgated. 1993 - Colorado Party wins simple majority of seats in first free multiparty elections, while its candidate, Juan Carlos Wasmosy, wins first free presidential elections. 1998 - Colorado Party candidate Raul Cubas elected president amid allegations of fraud. 1999 - President Cubas resigns in wake of assassination of Vice-President Luis Maria Argana. Luis Gonzalez Macchi appointed caretaker president, forms government of national unity. 2000 October - An army major and two other men are sentenced to long prison terms for their roles in Argana's murder. 2000 May - Coup attempt foiled. Government blames "anti-democratic" forces loyal to exiled General Oviedo. 2001 May - Head of central bank resigns over alleged involvement in fraudulent transfer of $16m to US bank account. 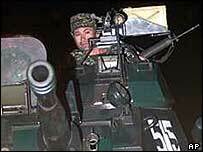 2002 July - State of emergency declared after violent street protests. Protesters demand resignation of President Gonzalez Macchi and scrapping of free-market policies. 2002 December - Congress votes for impeachment proceedings against President Gonzalez Macchi over charges which include corruption. Mr Gonzalez Macchi survives a vote to remove him from office. 2003 August - Nicanor Duarte Frutos, from ruling Colorado Party, sworn in as president after winning April poll. Predecessor Luis Gonzalez Macchi barred from leaving country and put on trial on corruption charges. 2004 April onwards - Peasants stage series of land invasions and other protests, demanding redistribution of agricultural land. 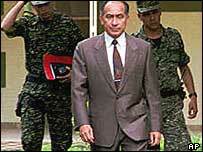 2004 June - Former military commander General Oviedo returns from exile in Brazil and is arrested at airport. 2004 August - More than 420 people are killed in a blaze at a shopping centre in Asuncion. Three days of national mourning are declared. 2005 February - President Nicanor Duarte promises a crackdown on organised crime following the kidnapping and murder of the daughter of former president Raul Cubas. 2005 June - Lower house rejects government proposals to privatise public utilities. 2005 August - Paraguay hosts the first-ever conference of landlocked nations. More than 30 states take part and demand preferential treatment in world trade talks. 2006 June - Luis Gonzalez Macchi, president from 1999-2003, is sentenced to six years in jail over illegal bank transfers. 2006 August - Former military ruler Alfredo Stroessner dies in exile in Brazil, aged 93. 2007 March - Government declares state of emergency in response to outbreak of dengue fever. 2007 September - The government declares a state of emergency after fires destroy more than 100,000 hectares of forest and agricultural land. 2008 April - Leftist former bishop Fernando Lugo achieves historic victory in presidential election, defeating the ruling party candidate and ending 61 years of conservative rule. 2008 September - President Lugo accuses his predecessor, Nicanor Duarte, and former military commander General Lino Oviedo of masterminding a conspiracy against his government. 2009 July - Brazil and Paraguay reach a deal to end their long-running dispute over the cost of energy from the giant Itaipu hydro-electric plant on their border. 2010 April - Security forces launch operation against left-wing rebel group blamed for spate of violent incidents in northern Paraguay. 2010 December - US diplomatic cables revealed by WikiLeaks show that Paraguay asked US Drug Enforcement Administration to spy on Paraguayan People's Army. 2011 October - Paraguayans approve a constitutional change giving the vote to the large number of citizens living abroad. 2012 June - President Lugo is ousted over his handling of a land eviction in which 17 people are killed. Federico Franco, his vice president, is sworn in to complete the remainder of Mr Lugo's term. 2012 July - The South American Mercosur trading bloc suspends Paraguay until next year's presidential election in protest at President Lugo's ouster, but stops short of imposing sanctions.